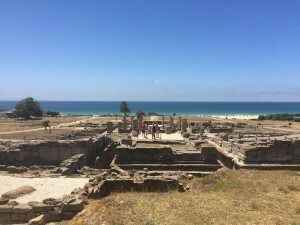 Vejer de la Frontera, Baelo Claudia, Tarifa! 20,256 steps, 9.1 miles, 122 floors, 3 cities, and 1 fun group. I never thought wearing a Fitbit all over Spain could be so entertaining. With all the walking here, everyday has been a competition to see how many steps we can take. Today was an exceptionally fun day because we got to see so much more of Spain beyond our lovely city of Cádiz. 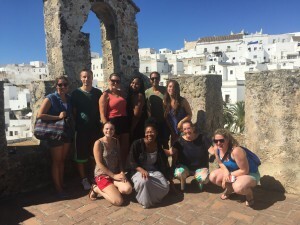 Our first stop was at Vejer de la Frontera where we definitely gained the most flights up, followed by Baelo Claudia, walking through ancient ruins, and ending with a lovely walk along the Mediterranean sea in Tarifa. 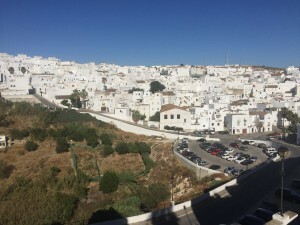 Vejer de la Frontera is a hilltop town sprinkled with churches, convents, and intriguing architecture. We had a lovely tour guide show us unique aspects of the town, from ancient archways to watch posts, where many had kept a look out for pirates. Baelo Claudia showcased ancient ruins overlooking the Mediterranean sea, a view I will never forget. You can see the Roman influences in the architecture from the basilica to the theater. It wasn’t until this visit that I truly noticed how much of an influence the Romans had on Spanish culture and history. The group carried on to Tarifa where we were able to explore as we wanted. We had an amazing lunch, did a bit of shopping, and finally were able to dip our toes into the Mediterranean. The color of the sea was like no other, looking out to the coast of Africa, crystal clear. These are the experiences you cannot learn in a textbook. 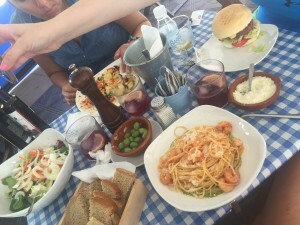 We live, eat, and breathe Spain. Living in the culture is definitely the best way to learn a new language. I spend my days talking with professors and locals in the language, I eat the food, I walk the streets, and now I even think in Spanish. It is certainly a warming feeling to have everyone around you willing to help you learn as well. The people of Spain are so welcoming and excited to be a part of the learning process. I wouldn’t trade this experience for the world. This entry was posted in Uncategorized by alexandra_dodge@student.uml.edu. Bookmark the permalink.